Kogan’s recent tribute starts by recalling the short, staccato conversations he had with another storied columnist, New York’s Jimmy Breslin, whom we lost on March 19th this year. 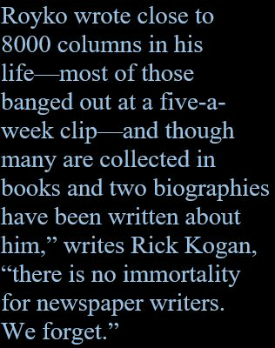 When Royko lay dying from a brain aneurism, Breslin would call Kogan every day for an update. On April 29th, 1997, when Kogan told Breslin that Royko had died at 3:30 p.m., Breslin said, “Goddam it. Well, Goddam it,” and hung up. Nearly all of Royko’s books were collections of his newspaper columns, yet his 1971 Boss: Richard J. Daley of Chicago, which won the Pulitzer Prize for commentary, shows that Royko’s sometimes careless prose could truly shine when he was freed from the constraints of his daily assignments. Writing in the New Republic, Roy Fisher wrote that in Boss, “Daley emerges as a complex mixture of integrity and debasement, of wisdom and stupidity, of vision and blindness, of compassion and brutality.” Daley’s wife, Eleanor “Sis” Daley, thought the book was “trash and hogwash,” and, Rick Kogan writes, “When asked about his wife’s review…Richard J. replied with that characteristic grin, ‘She’s entitled to her opinion.’” David Starkey and I included an excerpt from Boss in our book Smokestacks and Skyscrapers: An Anthology of Chicago Writing. Royko, the son of saloon keepers, was born in a Polish neighborhood on the Northwest Side of Chicago in 1932. He grew up among drinkers and fighters and, not surprisingly, some of his best writing is set in the city’s bars. 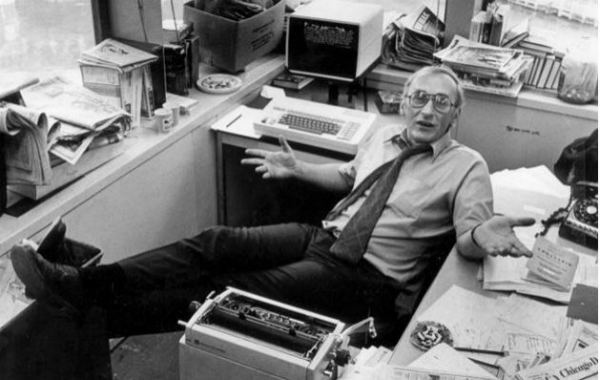 After a stint in the Air Force, Royko became columnist for the Chicago Daily News from 1959 until the paper closed in 1978. He wrote for the Sun Times from 1978 to 1984, and finally, in a move that coincided with national syndication, for the Tribune from 1984 to his death. Royko, whose higher education consisted of two years at Wright Community College, was always skeptical of intellectuals, seeing himself as a champion of the common man and a debunker of frauds. His most famous alter ego was the tough-talking, cynical Slats Grobnik. Rick Kogan ends his tribute to Royko recalling his wife Judy’s reflections on Royko and the Cubs. “She can remember vividly the night when the Cubs clinched the 1984 division title. She and Mike watched the game at the Billy Goat Tavern. It was jammed, and after the victory, people, strangers mostly, approached Mike to exchange high-fives. Quietly, gently, he grabbed Judy by the hand and led her from the bar, up the stairs and out onto Hubbard Street. She thought they were headed home. Instead he took her in his arms and they started to dance. ♦ Go to a list of Chicago Writers, and to the Smokestacks and Skyscrapers page, where you can also BUY the book. This entry was posted in Chicago Writing, Writing and tagged Boss: Richard J. Daley of Chicago, Chicago Cubs, Jimmy Breslin, Mike Royko, Rick Kogan, Smokestacks and Skyscrapers: An Anthology of Chicago Writing. Bookmark the permalink.